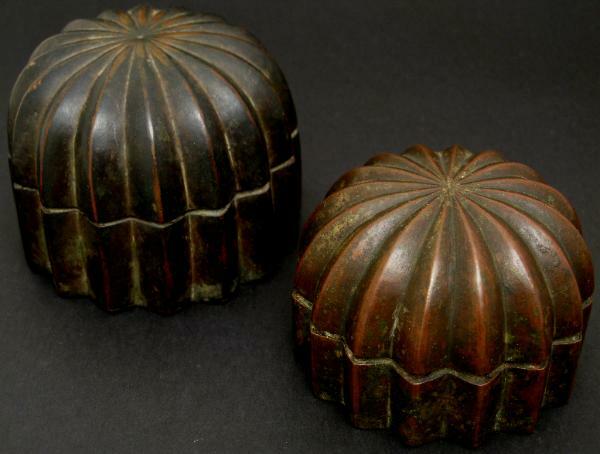 This pair of paan boxes or pandans are of circular form with a convex lid and with deeply gadrooned sides giving them an architectural quality. A pandan of similar size and form but with less prominent gadroons can be seen in the collection of London’s Victoria & Albert Museum (inventory no. 18 57-1985). The pair have a lovely patina from use and obvious age. Gold, Silver & Bronze from Mughal India, Alexandria Press, 1997, p. 273.